The Le Sigh: Video: La Sera - "Break My Heart"
Video: La Sera - "Break My Heart"
We have a tendency to review things involving Katy Goodman. 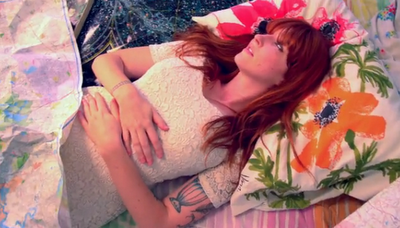 Emily reviewed La Sera's (Katy Goodman) music video for "Real Boy / Drive On" a few months ago. This afternoon Goodman announced that the video for "Break My Heart" (another track on the album "Sees The Light") was up. The footage for "Break My Heart" is highly saturated with an awfully pretty and pink hue. The video starts with Goodman cutting up photographs of an ex-boyfriend and soon the world inside her room becomes chaotic. Like the song, there is an upbeat energy that carries the short film through. Maps, posters, records, and a pair of bright pink scissors float around with a life of their own. Goodman (probably so heartbroken that she's hallucinating) runs around in a frenzy while singing the chorus "I've done wrong, I've done wrong / Break my heart, break my heart." I'd like to note that the above video was directed by Cassandra Lee Hamilton. After Romney's "binders full of women" comment in last night's debate – it's nice to be able to highlight talented ladies creating beautiful music and film. If you haven't already buy the album here at Hardly Art Records.